Using a metronome may have actually helped my cadence this morning. Once I start using my foot pod (good suggestion FS) I will know for sure. It was a weird run, punctuated by a ringing cellphone that I would normally ignore. Today I had two good reason to stop. First, the call was business related and important. Second, the ringing phone shut the metronome app off. Grrr. 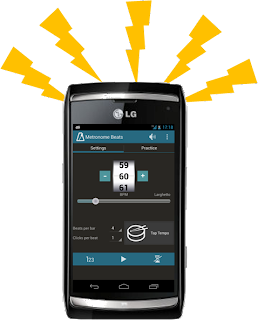 I used the Metronome Beats app today because it has better features than the one I tried yesterday. 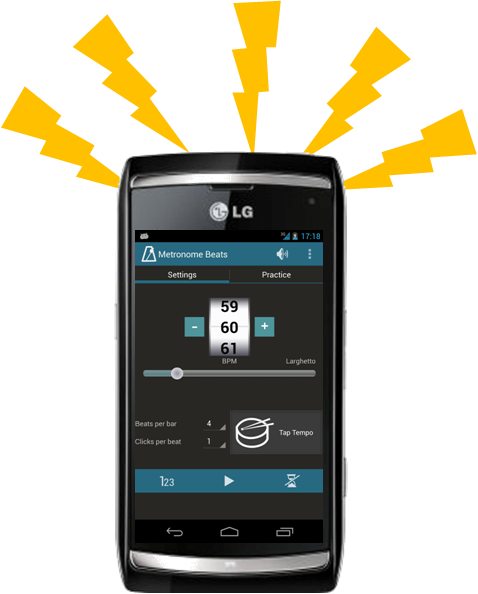 Most importantly, it punches out beats loud and clear, unlike Metronome Mobile's softer sound. I set it for two clicks per beat, which is easier than trying to coordinate two footfalls to a single beat. Focusing on the sound made my first mile go by quickly and the odd beeping noise produced double takes from neighbors as I passed by. The phone call caused an interruption and I was honest about being in the middle of a run. That was no problem and I think the endorphins helped keep me calm during an intense conversation. Soon I was back to the run and I realized that it would be easier to time my arm-swing to the rhythm, rather than try to keep my footfalls synchronized. Do your arms move at the same rate as your cadence? That would be interesting to know. I moved really well and everything was fine, until the app quit about half a mile from home. I considered stopping and restarting the metronome, but I'd already stopped once on the run. I tried to "think" the beat that I'd been following and that may have worked. Today's pace was 9:22 and it felt fairly easy. I'd set the metronome one SPM faster than yesterday and that yielded a 2.4% improvement in pace. That assumes a lot, but it was progress and that came from somewhere. OMGosh. This morning, while I was out on my run, I thought of posting in yesterday's comments here about JUST THAT, and I forgot about it once I started my own posting. Arm swing keeps pace with foot fall! It's neurologically wired into us. I ALWAYS try to encourage my balance patients to swing their arms when they walk especially the ones with gait deficits. Good catch on that! I usually increase my swing cadence and pump slightly forward of my center of gravity going up hill, and use a more measured cadence with elbow swing slightly behind me going down hill. It keeps my center of gravity from exceeding my base of support going down a steeper hill. It works! TPP - thanks for confirming the step and arm-swing relationship. I've read articles that said you should use arm swing on hills to help maintain a steady rhythm. It's good to know that I can use that technique to control cadence.